Less than 4 weeks into our trip and we’ve seen many animals on our trip so far. Some we’ve been able to catch, others have been more reluctant to meet us, but most, we’ve simply enjoyed spotting and viewing them. What exactly are these encounters you ask? A family favourite so far has been the Shingleback lizards and the boys have had a great time carefully picking these gentle lizards and looking at them closely – they’re more like mini dinosaurs. 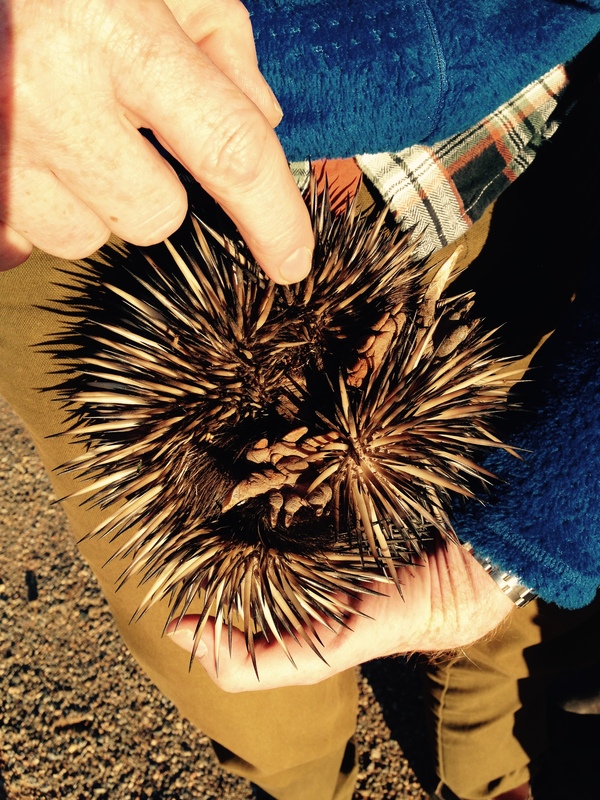 We also stumbled upon a feisty Echidna (if there is such a beast :)) at Mundi Mundi near Silverton about an hour before sunset. Although Geoff managed picked her up with out too much trouble to look at her soft furry tummy, all she was really interested in was getting back to his (or her) ant nest which we found her digging on. Still, she was not worried about us and she happily went back to her gathering her dinner and we moved on. We have seen several goana’s – Geoff even tried to catch a small goanna on one occasion, but even his long legs couldn’t beat the little guy. In the midday sun, these guys are ground based rocket ships. We’ve seen the odd snake (not as many as we would have expected) but they are around. 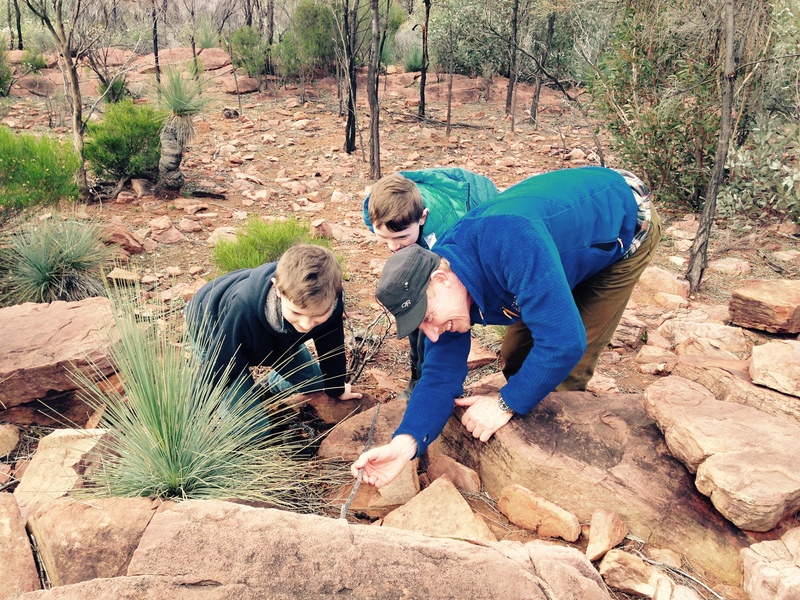 The boys have enjoyed spotting many types of spiders that live life well in the bush. They’re easy spotting at night with a decent touch as there (many) eyes reflect coloured light. We’ve also seen feral Goats, even a feral cat, a couple of foxes, and all types of bird life. Especially great to see the many species of birds of prey (Falcons/Hawks, Eagles and Peregrines) mainly along the side of the road at a roadkill, but occasionally around our camp or on a bush walk. as well. Funny guys! 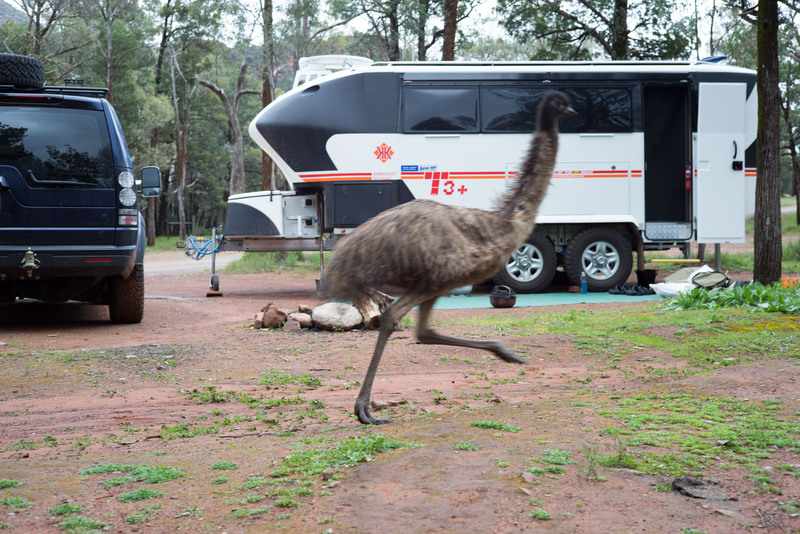 Here’s a local Emu scuttling through our camp in Wilpena Pound, SA. And the biggest (& funniest) bird of all, the Emu. Emus are everywhere out here particularly since hitting Broken Hill and all the way through to the northern part of the Flinders Ranges in SA, an abundance of them. Moving forward though, we’ll be keeping “some stats” on a few certain animals we see (and catch) and will post these on a blog in the future for a bit of interest and a laugh. Evidently, we’ve seen so much wildlife almost 6 months on the trip – some of which has been documented within Blogs, so we decided to list a few images of our favourites so far. And don’t forget to “Mouse over” each image for a little detail on each image. An Emu in our face at Exmouth, Western Australia. Boobook owl Watching and those EYES!